Would you like to learn how to apply make-up correctly that not only enhances your natural beauty, but lasts the entire day? Well, I can answer these burning questions for you and SO much more in my group Masterclasses. Make-up can be a wonderful tool if used in the correct manner and the skills you will learn will be invaluable for years to come. I have a wonderful model on board to help me demonstrate a variety of application techniques whilst you lovely lot sit back, take notes, soak up the wonderful and exciting world of make-up and fire any questions you may have at me. There will also be a practical element to the class to enable you to utilise your new skills. There will also be thorough hand-outs included in a booklet to refer back to, a goody-bag for attendees containing luxury samples and hand-picked products for you to take away, special offers and a free online after-care service for all. 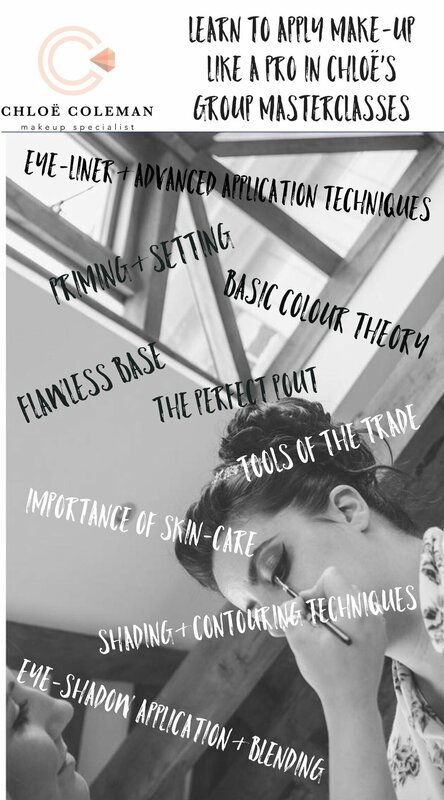 Unlike many make-up classes, my masterclasses will be kept small and intimate to allow a quality and thorough learning experience, with parties of just 8. The first class will run on SATURDAY 30th SEPTEMBER from 11:00am-3:00pm in Ladbroke, Warwickshire. A short break and refreshments will be provided. The fee is £50.00 per person (a £20.00 non-refundable deposit will be required to secure your place with the remaining balance payable at least a week before). No previous make-up experience required. I can't wait to share my knowledge & passion with you!